The Simple Life of a Queen: Sunshine And It's Warm Too! Sunshine And It's Warm Too! Hello and happy Thursday everyone! It's warm! It's in the 70's today and I'm soaking it all in. The weekend is supposed to be cool and only in the 50's so I have all of the windows wide open and I'm enjoying the warmth. 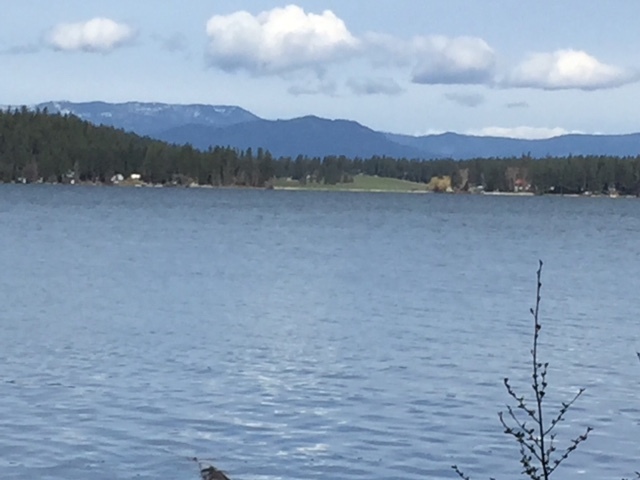 Monday morning I took a walk at the lake before coming home. Don't let the sunshine fool you. I had my winter coat, hat and mittens on. It was COLD but beautiful anyway. 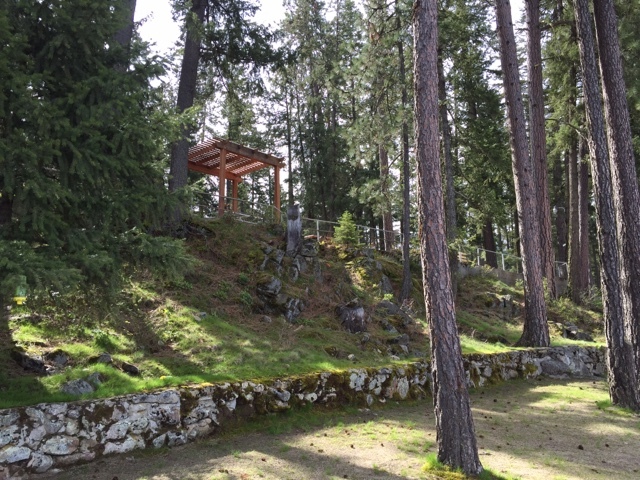 I was the only person in the park and I loved the quiet. I haven't been crafting quite as much as usual. We're getting ready for a garage sale on May 20. Several families on our block are all having one the same day. I don't normally have much luck with them, but since there are several other people having sales, maybe there will be more of a turnout. I'm finding I can only work for an hour or so and then I have to sit down for at least an hour to rest my back. It's taking a long, long time to get things together and I haven't even began pricing things yet. I usually find these sales are a LOT more trouble than they're worth. I did make a doily though. It's about 16 inches across so a nice size. Here it is being used on the island. 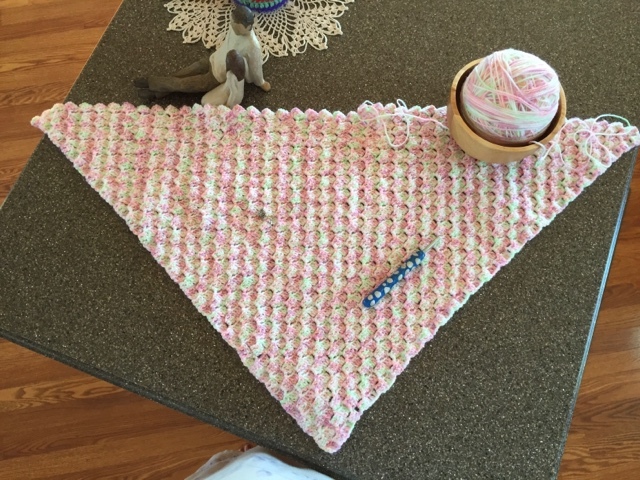 The knitted baby blanket was ripped out and a Corner-to Corner crochet one was begun. I guess I just wasn't in the mood for knitting for some reason. I received this lovely package in the mail on Monday. 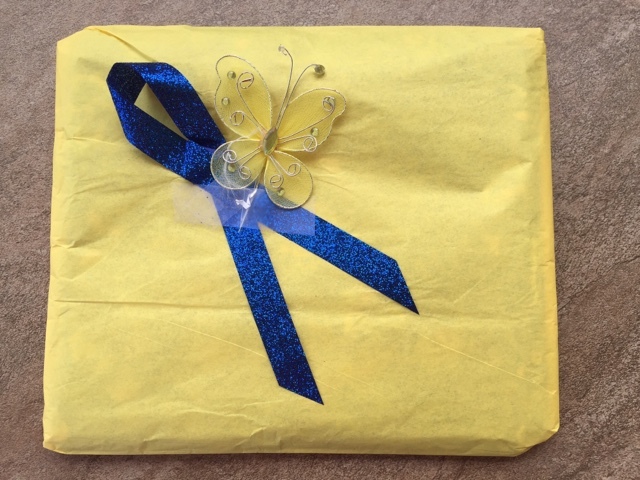 Isn't this wrapped, just so special? I love the butterfly. It was from Roxy at the "Living from Glory to Glory" blog on my sidebar. 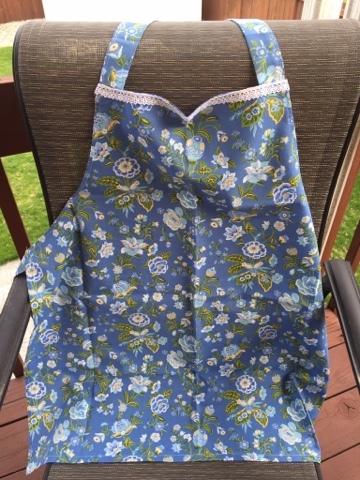 She made me this sweet apron and had even noticed the color of my kitchen walls and made it to match. Wasn't that just the sweetest thing? 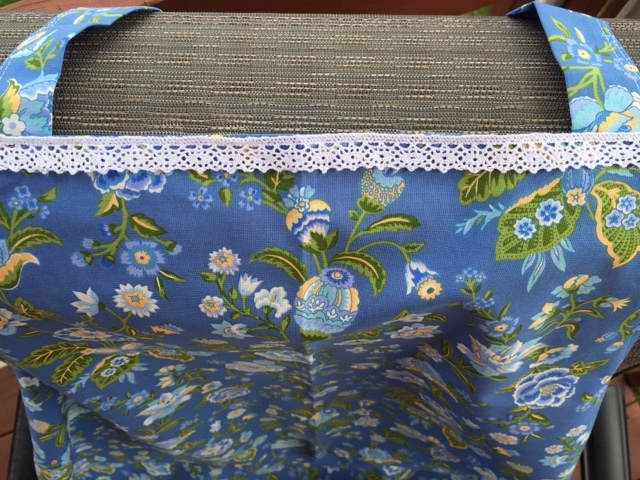 I love the pretty lace at the neckline. I've been wearing it already and love it. Thank you so much Roxy. It will definitely be a well-used apron. 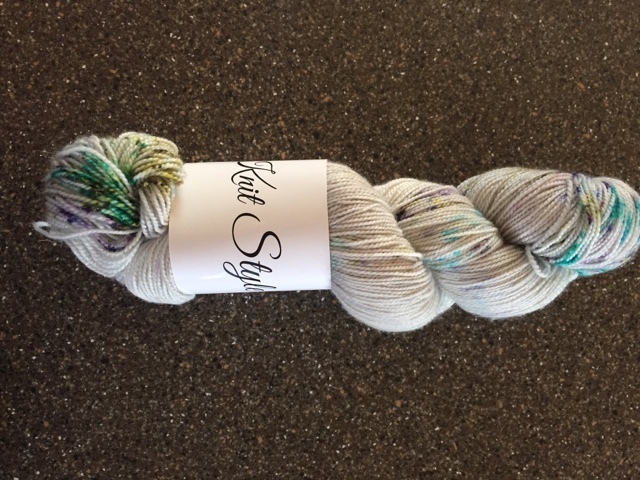 And then, I won another skein of yarn, this time from the "Knit Style" podcast. I merely commented on her anniversary episode and she drew my name for the yarn. Isn't it gorgeous? She hand dyes all of her yarn and the colors are amazing. Can you see the sparkle of the strands of stellina in the yarn? It doesn't photograph nearly as well as it sparkles. She has an Etsy shop under Knit Style and has lots of colors and even project bag and yarn kits. Dennis bought me four new shawl patterns from Ravelry for Mother's Day. 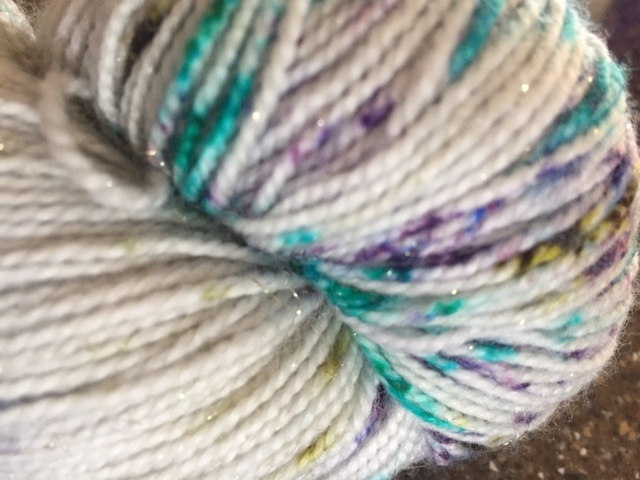 I bought some beads this morning and I think I'm going to use this yarn for a beaded shawl. 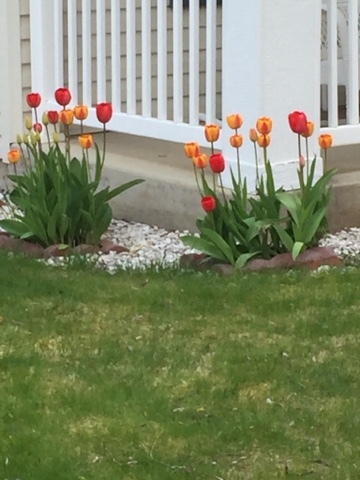 and these tulips on my walk yesterday. I've also been going through old photos this week. I took pictures of pictures with my phone and this is the result. Not bad. I'm taking the originals all back to Omaha next month to my siblings to share amongst each other. I rescued a bag of family photos from the burn barrel years ago when my Dad remarried after my Mom died. Our step-mother was just going to burn our family history. I don't understand that. There was also a quilt I had made for my parents in the pile to be burned. My Mom had never used it because she was "keeping it for good." I'm so glad I happened to drive by when I did or they all would have been lost. There were photos of our great grandparents as well as the younger generations. This is a picture of all of us kids, I think from 1965 or so. 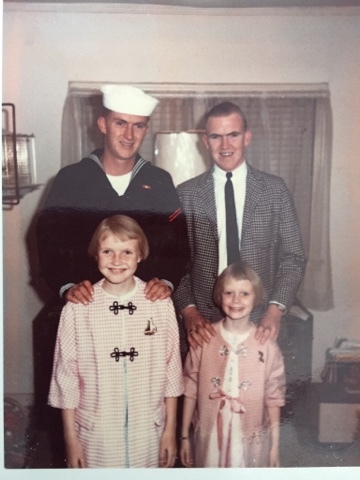 My oldest brother Roger is the sailor. He was home on leave from the Navy. Lynn is next, then my sister Melanie is on the left and I'm the baby. I remember my Mom sewing us those coats and I was so proud of mine. Maybe I'll share a photo from the past when I blog. Would that interest any of you? I may not be crafting quite as much as usual for awhile. I have lots and lots of books that I want to read this summer from my bookshelves. I have bought books and never taken the time to read them. In preparing for this yard sale, I've realized that I have way too many books. I'm taking lots back to Omaha to Mandy next month and selling some in the yard sale but I still have shelves left of unread books. There are only so many hours in each day so I want to dedicate time this summer to reading. I'm sure there will be some knitting/crochet happening too, but it will definitely slow down some. I hope all is well in your world wherever you may be. Have a lovely and safe weekend my friend. What beauty in your Spring there! With mountains as scenery and the bright colors of those tulips....so beautiful! 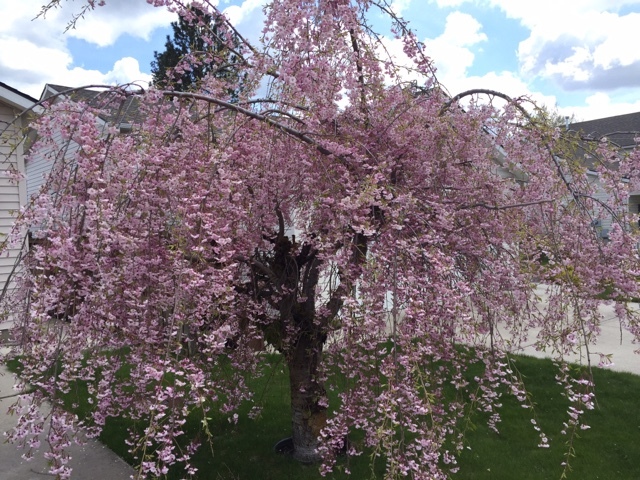 The blossoming tree is bent over it is so heavy with blossoms. I used to do my toes all the time but here I just wear sneakers all the time. Looking at your lovely family picture you are lots younger than me! I graduated HS in 1967! I could've been your baby sitter! LOL! I love reading too....so many wonderful interests to pursue! I'm glad you were able to rescue the old photos. I'm afraid the same thing is going to happen to my sister's family. She died February 2016 and her husband is remarrying this July. It's sad to see family history being erased. The doily is lovely. I use doilies on my end tables. Glad you were able to save family history. It was a God thing, I think! Why would she have wanted to do burn it? Not a good thing, I'd say. But thanks for sharing the photos. Maybe you can easily pull the photos out of the frames and photo copy them? 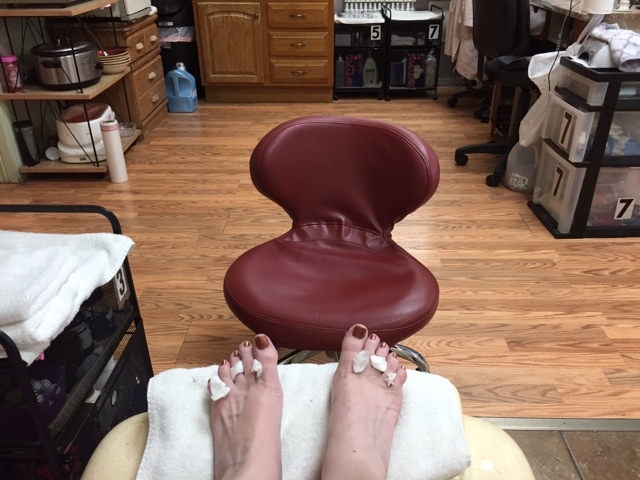 Awe, the pedicure. Glad you had one and I like your toe polish. I need to read more as well. I've stopped myself from buying any more books til I've read what I have already. I'm not sure when I can come visit....need to talk with Phil. Not next month for sure.We've had two warm days here and now it's back to cooler weather, with some storm warnings in our county corridor. Hugs and blessings, my friend! Crafting here is slowing down too in the short term until we have settled a little more. I loved to see the old photos, fashion and style is of great interest. Old photos are helping us to recreate some features of this cottage. I too am enjoying a book or two in the evening. Hope your sale goes well. Isn't Roxy the sweetest friend and sister in the Lord, to take notice of your colours and all, what a gorgeous apron. I love your skein of wool you won too, hope the scan gives some reason for ongoing pain, praying for soloution for you... in Gods great mercy. And spring flowers esp the wondrous tulips ... what colours eh? Pray too garage sale is blessed of God..
... and loved your pickie from the past. Great to reminisce and how merciful of our Lord that your pickies were rescued and that rug. Some folks are not able to think past their issues to see it from another's. Step mums can be like that in my experience also. Sad. The doily is so pretty! Nice work on the baby blanket, too. It does go faster to crochet a blanket than to knit one! Oh, I would LOVE to see the photos, if you care to share! And, my dear friend, I cannot even begin to tell you how it broke my heart to think of those precious pictures and that dear quilt on the burn pile! I cannot even imagine someone so carelessly and thoughtlessly tossing away the history of a family! My goodness, that just bothers me so much. I can't understand some people. It reminds me of my dear Mom's step-mother. My Papaw remarried after my Mimmie died, and that woman did some hurtful things. I don't know how people can devalue another person's history and heritage, but I just praise God that you found that stuff before it was destroyed...oh, that would have been SO sad. It is wonderful to see that spring has finally visited your corner of the world! I trust the Lord will bless your garage sale efforts...I agree with you completely. It is often just better and brings such a blessing to just give it away instead. Your toes look beautiful, and I am so glad you treated yourself to a pedicure. You are so deserving of all things good!!! Sending love and hugs to you today! Fun pictures! Loved the one of you as a child with your siblings! And what a lovely apron! So sweet. You keep resting now!!! Get better!! 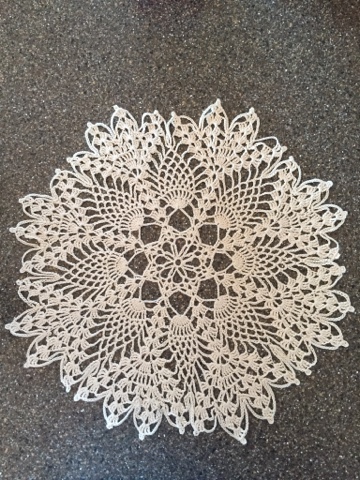 Such a beautiful doily! 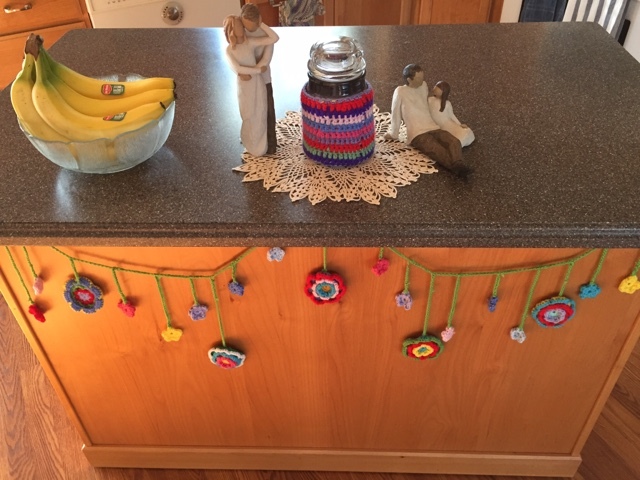 You are a very talented crocheter, oh, and knitter also. Enjoyed all of your photos. The last couple of days we've had late afternoon sun, now if it'd only start the day that way! We Survived the Garage Sale!